and get the stealth Erowid "Hip Logo" t-shirt! Medieval nobles consumed pepper by the pound because it was reputedly imported from the gates of paradise. Then came coffee, "the Great Soberer," which supplanted beer at breakfast tables of the industrious Protestant bourgeoisie even as the Catholic upper classes sipped chocolate in their boudoirs. And before it was banned in our own century, opium was both a stable of the middle-class medicine chest and the sacrament of Romantic poets who cherished its dreamlike high. The craze and craving for these and other substances emerges in a striking new light in this provocative and bountifully illustrated new book, which shows how the appetite for pleasure transformed the economy and social structure of the Old World. 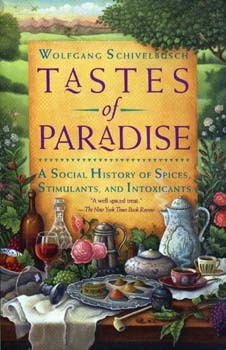 Whether it is examining the significance of raising a glass for a toast or chronicling tobacco's transformation from snuff to cigarettes, Tastes of Paradise is an intoxicating blend of theoretical sweep and historical detail that evokes comparison with the work of M.F.K. Fisher and Diane Ackerman. "Delicious...brightly accessible...a stimulant in its own right." "Offers readers many bit-size bits of historical lore." "From the proper manipulation of a snuff box to such large themes as the grim commercial depredations known as the Opium Wars, Tastes of Paradise is frequently unexpected and always engaging."